i've discussed this topic various times in the past week, so i figured it was time to introduce it to blog land. blog land, meet the ladder theory. one for friends and one for potential lovers. 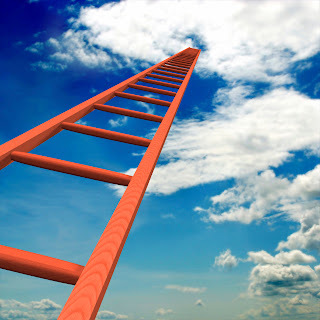 a man can move up and down the ladders based on how good of a friend or potential lover he is. if he's near the top of either ladder, he gets time and attention. conversely, men have one ladder. at the top of the ladder is attraction, and at the bottom of the ladder is ...not attraction. if a lady is near the top of the ladder, she gets more time and attention. 1. men may receive copious attention and time from a woman, only to discover that they are merely highly ranked on the friend ladder. 2. men do not generally give excessive time/attention to a woman if she is low on the ladder. therefore, even if she is truly "just a friend" but she is earning time/attention, he is at least remotely attracted to her. 3. it's difficult for men to switch from the friend ladder to the lover ladder in a lady's eyes. 4. if women want to be considered, all they have to do is climb the ladder, i.e. become more attractive, whether physically or personality-wise, etc. ...your thoughts? agree or disagree? p.s. the word verification is "hoenes." nuff said. Sounds true. I saw something about this done in a Youtube video on Utah State campus. I personally disagree with numero tres, but maybe that just means I only have (had) one ladder like a guy. @shirley i think that's entirely possible. i definitely know other girls with one-ladder tendencies. i'm pretty sure i have two, though the older i get the more i try not to, because i want to be kind and not put any boys through what i've seen so many guy friends go through at the top of a lady's friend ladder. i think girls think they're being nice by giving "platonic" time/attention to a guy who's clearly interested, but i think it's just more cruel in the end. Your theory is 100% correct! I love it! And it's such a good way to explain these things to people so that it actually makes sense! Haha. the ladder theory ROCKS MY WORLD. "he looks like a pink nightmare." public breastfeeding: wrong? right? medium-well? put ME in the zoo. happy christmas from new zealand! he had the crazy eyes. the first half of a chick flick.